Log-in here if you’re a member with access to the Closer. Looking for deeper insight on markets? In tonight’s Closer sent to Bespoke Institutional clients, we check up on breadth and overbought levels by looking at the percentage of S&P 500 stock reaching new 52 week highs vs lows, distance from the 200-DMA, and RSI. We run the same analysis for the European Stoxx 600. 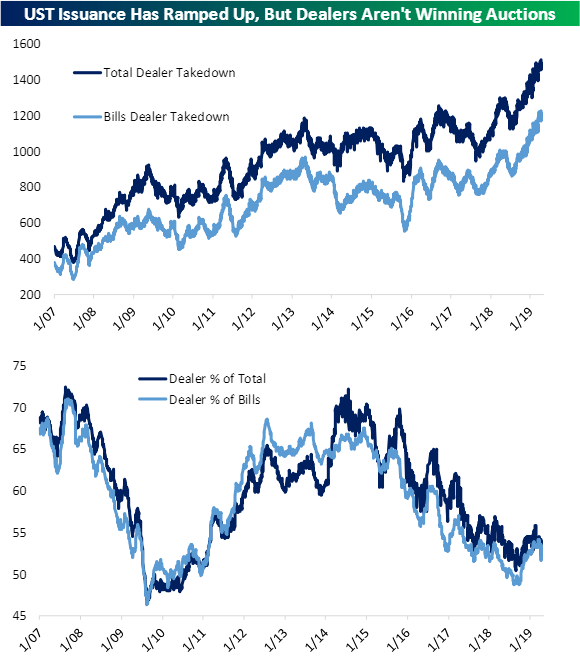 Switching to interest rate markets, we counter concerns that dealer demand has been weak in UST auctions. Pivoting to economic data, we look South and North of the border, examining weakening Mexican labor and secondary industries as well as today’s Bank of Canada quarterly business surveys. We finish with a look at how international investors have turned a cheek to US equities as seen through today’s TIC flows. See today’s post-market Closer and everything else Bespoke publishes by starting a 14-day free trial to Bespoke Institutional today!